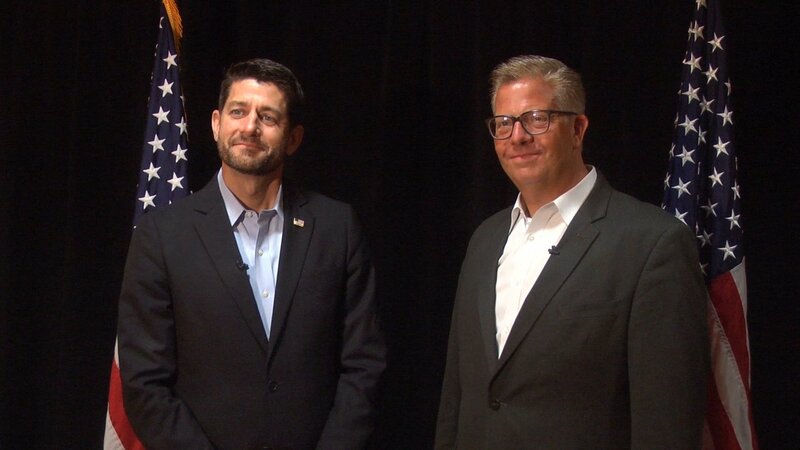 CHICAGO (WLS) -- Speaker of the House Paul Ryan hit the Chicagoland campaign trail Tuesday, headlining a Loop fundraiser for U.S. Rep. Randy Hultgren, R-Illinois, of the state's 14th congressional district. The speaker's visit comes as Hultgren faces a challenge from Democratic upstart Lauren Underwood, hoping to unseat the incumbent from the post he's held since 2011. She's proving to be a formidable opponent, having outraised Hultgren last quarter by nearly $150,000, according to federal filings. Democrats nationally are focused on this race, with the Democratic Congressional Campaign Committee designating IL-14 a "red to blue" district. On its website, the DCCC describes this as a program that "arms top-tier candidates with organizational and fundraising support to help them continue to run strong campaigns." Despite this, and potential growing grassroots democratic interest in the district, Congressman Hultgren and Speaker Ryan expressed optimism for the November general election. Speaker of the House Paul Ryan hit the Chicagoland campaign trail Tuesday, headlining a Loop fundraiser for U.S. Rep. Randy Hultgren, R-Illinois. "Historically these are tough elections, election after presidential election...We're working it hard but I take every election very seriously and this one's no different than that," said Hultgren. "We're really confident that when people sit down and look at the results that Randy Hultgren has achieved for them, they're going to vote for Randy Hultgren," said Ryan, adding, "he is a hard-working member of Congress, he's achieved phenomenal results for the people here in Illinois." Brushing aside concerns that IL-14 is a vulnerable GOP district, Ryan touted Hultgren's work on Dodd-Frank reform, human trafficking legislation, and support of the controversial Republican tax cut Congress passed late last year. As ABC News reported, with the new tax plan, the "top individual rate" dropped to 37 percent and the corporate tax rate was cut 14 percent. "Hultgren and Ryan moved to inflict further damage to this community by funding a corporate tax cut at the expense of many of our middle class families, all while exploding the federal deficit," said Lauren Underwood in part in an emailed statement from her campaign (she was unavailable for an on-camera or phone interview for this story). Still, as Ryan pointed out, the plan included a doubling of the standard deduction for middle class tax payers. "It's amazing the economic growth we're seeing because of the Tax Cuts and Jobs act. We want to make the middle class tax cuts permanent. That's something we're going to be doing in September," he said. When asked about the new $10,000 state and local deduction limit, Hultgren suggested Illinois leaders may need to find a way to make cuts at home. "We need Springfield to step up. We need legislative leaders there to do the right thing to start living within in our means here in Illinois so that we can be competitive with Wisconsin, Indiana, other great states around us," said Hultgren. During our brief conversation after the downtown event at the J.W. Marriott, I also asked the two congressmen about President Donald Trump's missteps following Sen. John McCain's death over the weekend, specifically the White House's raising of the American flag from half-staff and Trump's delayed official statement on the senator's passing. "I'm glad the White House reversed course and did the appropriate thing like the Capitol had always done on keeping our flags at half-mast until the interment. I have not spoken with the president about any of this. But the point is this: John McCain was a hero, a friend of ours and... we think the appropriate thing is to honor this American treasure and that's exactly what we're doing," said Ryan. I asked Hultgren how he will approach the issue with veteran voters in his district if they feel the president's actions have been disrespectful. He didn't address the president's actions, choosing to comment only on McCain's career, calling him "a hero willing to serve, willing to give everything for our country and continued to so that in his public service afterwards." In her emailed statement, Underwood added broadly, "Our community deserves a leader who will serve as a check on Donald Trump and Paul Ryan's agenda: Randy Hultgren is not that leader. I'm running for Congress to be the champion our families deserve in Washington."